A woman is not just a mother, wife, sister or daughter but she is a bountiful entity who can bear enormous pressure and still remain poised and graceful. Pakistan is in the grips of political turmoil, rampant corruption, fuel shortages and the threat of terrorism, yet the resilience and courage of its women are nothing short of remarkable and awe-inspiring. 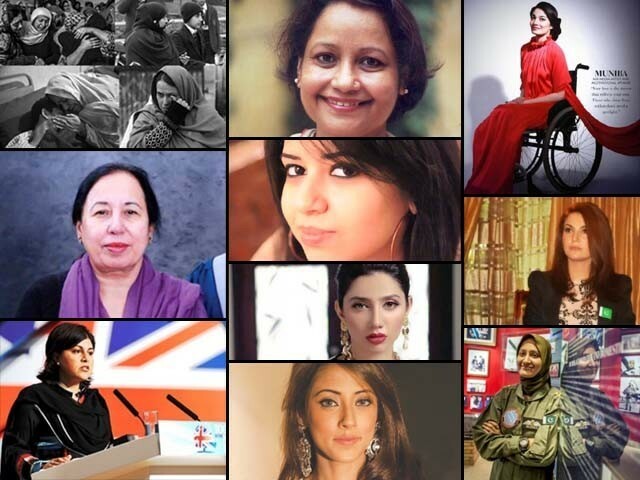 On International Women’s Day, I felt it was appropriate to commemorate these inspirational women who, despite adversity and hardship, strive hard to shine a positive light on Pakistan’s splintered image. They make Pakistani men and women proud and, in turn, teach us all how to stand tall in the face of troubles and strife. The green-eyed beauty who graced our TV screens in 2010 with her stunning presence, is not only beautiful to look at but is also the voiceover for the Burka Avenger, a televised cartoon series that airs on Nickelodeon Pakistan. The show centres on a superhero, draped in a burka, who avenges those who commit criminal activities; a character who doesn’t take any nonsense despite being covered from head to toe. In February 2015, the program was nominated for an International Emmy Kids Award, a huge accolade and one that no other Pakistan-based programme has been nominated before. Ainy looked stunning in a Sana Safinaz gown when she attended the ceremony and, despite missing out on the award, shone the light for Pakistan and its creative talent. Born in Risalpur, Shaheena Waqar established an organisation known as the Women Aid Trust, along with two other friends, in 1997. Through this organisation, she has been able to help women in prisons by teaching them different skills and educating them so they may be able to sustain themselves once they return to the real world. She believes that this exercise helps build a sense of community amongst these women, who have been convicted for some petty crime, thrown away in prison and now feel dejected and lost. By providing them computer classes, sewing centres and recreational institutes, Waqar is able to produce in them the motivation they need to rebuild their lives. Her cause is not only noble, but effective as well and we all should be proud of having people like her in our midst. Just as it seemed as if the dust had settled on the Humsafar craze in Pakistan, our neighbours also became fanatics for the drama serial and it skyrocketed Mahira’s fame beyond our borders. After a highly publicised PR event in India, news emerged that Mahira would be starring opposite the maestro of Bollywood, Shahrukh Khan, in a movie titled Raees. It seems that her popularity has seeped through into India and we will be seeing a lot more of the starlet in the future. She will shine the beacon of light for Pakistan within India’s bustling entertainment industry. Naila Jamall Aladin is known for her tireless work to establish The Learning Tree School, which found its roots in 2000. What is unique about this school is that it incorporates diversity – it doesn’t just focus on education, it helps children groom themselves for what’s coming ahead. The school caters for all students, including those who have special needs, and helps them understand their strengths and weaknesses so they may fare better. This school instills in its students the idea of giving back, helping the community and benefiting more than just oneself, and all these traits are much needed for every individual in Pakistan today. Though just a drop right now, Aladin and her school are working towards creating substantial waves and they should be supported and appreciated. Farahnaz has been able to bring pressing issues regarding women’s emancipation and health in the limelight and was able to inspire her co-workers and readers alike to strive for a better tomorrow for everyone, especially women. While beginning with just her A-levels security-deposit money as initial capital, Aamina Jahangir was able to establish the fact that Pakistani women can be great entrepreneurs too, if only they use their skills and resources smartly. Running her deliciously sweet business venture, aptly named The Cakery (since she specialises in baked items and cakes), Jahangir has been able to introduce herself as a force to be reckoned with. The entrepreneur has a diploma in law and she manages her venture by assistance from different companies who sponsor her delicacies – Proctor & Gamble being one of them. The Cakery is making new waves for culinary minds to persevere and realise their own dreams, which is motivational as well as exceptional. Working with children who belong to the more destitute, slum areas of Karachi, Salma Habibhas been a positive force in helping children and harnessing their artistic skills. She works with them by providing the resources, stationary and place for these children to draw and showcase their talent. By helping these children express through art, Habib is able to create a sense of individuality and self-esteem in them, which is often lacking in street children. Every week, she focuses on a band of children and assists them in addressing their qualities, which is inspirational to say the least. More people like Habib need to be present in our society, so that these children may be able to find some colour in their perpetually grey lives. Shabina Mustafa is one of those people who aim towards a goal and do everything in their power to achieve it. While chasing her dream to disseminate education, Mustafa started a school in her own garage, which was later dubbed as The Garage School, where she helped underprivileged children receiving education. This school was formed in 1999 and she has been persevering with it ever since. Today, even after so many years, the school still operates from a rented building in Neelum Colony, Karachi, and has helped hundreds of students over the years. Pakistan’s first female fighter pilot is not a woman to be messed around with. Like a scene out of Top Gun, Ayesha dons her military attire and olive green hijab with aplomb and ease, even though she works in such a testosterone-fuelled profession. Ayesha has been involved in purging Waziristan off Taliban strongholds and is thus a hero in her own right for risking her life for the security and safety of Pakistan. She still maintains close links with her faith and culture yet is breaking taboos and cultural norms by pursuing this profession. This was a difficult choice for me because Reham Khan has been shrouded in controversy since her advent into the public eye. Imran Khan’s choice of marriage partner was bound to be just as questionable as his political choices, especially since Reham was a divorcee with three children and a BBC news presenter who wore controversial attire when she lived in Britain. To add to this drama, it seemed that Imran Khan’s family were wholly against the nuptial and Reham’s former-husband even denied the domestic violence allegations made against him wholeheartedly. I chose Reham because she remained poised and graceful despite all the ridiculously cruel comments made about her character. She continued to smile and remained very polite in her dealings with the media. In a society which regards divorced women as tainted, it was very refreshing to see a single mother remarrying in a conservative society like Pakistan. It gave divorced women hope and Reham also set a high benchmark of how to behave when people make all kinds of libellous allegations against a divorcee. I first came across Muniba on Instagram and was blown away by her encapsulating smile and positive energy which would often pale her wheelchair into insignificance. In a society which regards disability as some kind of curse, Muniba has risen as a phoenix amongst the ashes to become the face of dignity and refined determination. Not only is she an accomplished artist but she is often seen shedding light on the greyer areas of Pakistani society with elegance and grace. She became a paraplegic following a tragic road traffic accident but instead of wallowing in perpetual grief, she showcases her paintings on her blog, Muniba’s Canvas and stands tall. She also visited the survivors of the APS tragedy in various hospitals and is a strong advocate of children’s rights and education. I am expecting greater accolades from Muniba in the years to come and wish her success in her endeavours. Although Baroness Warsi was born and resides in the UK, she still shines the light for Pakistanis based overseas. Her name is mentioned here not because of her political or lawyerly prowess but the stance she took on Israel’s bombardment of Gaza in the summer of 2014. Warsi sent a strongly-worded letter to David Cameron, the prime minister of the United Kingdom, about how she could no longer partake in mainstream British politics because of the UK’s “morally indefensible” stance on Gaza. This was a slap in the face of quiet servitude within politics and proved that Pakistani women remain strong-willed. Most principals throughout schools are known for their emphasis on discipline and decorum but Ms Tahira Qazi will always go down in the history of school leaders as being the bravest principal ever. Her strong motherly instincts came into play on that heinous day when APS Peshawar was attacked and innocent lives were lost. Instead of absconding, Ms Qazi remained with her students whom she saw as her “children” and she made sure they reached safety and then she faced the sheer evil of the terrorists. They prodded her for information about where the children were hidden but she remained stoic and said that she was the mother of those children. She lost her life protecting countless students and will always be revered for her heroic stance on that disastrous day. Ms Qazi was a beautiful soul who once again showed how selfless and unselfish a mother’s love is. When I think about that horrific day the epitome of innocence was shattered, it still raises a huge lump in my throat and tears well up in my eyes. The day that no Pakistani must ever forget: December 16, 2014. The day 145 innocent souls departed this world. It is unfathomable for any mother throughout the world to send her child to school only to find they have been brutally murdered in such a chilling and cold-blooded manner. Those mothers who lost their sons on that tragic day are the true definition of resilience and bravery as they face the prospect of waking each day without being able to hug their children. Their children were taken from them by a war which had absolutely nothing to do with them and these mothers are now making the ultimate sacrifice; trying to move on. While the rest of the country now tries to return to some form of normalcy, these mothers will always carry the gravest of burdens and heaviest of hearts. While they should be running their fingers through their sons’ hair to reassure them, they will be left wanting and wondering “what if” my son was alive today. The pain will never dissipate but remain like a dull ache forever. These women are to be revered and respected for the tremendous loss they bear each and every day and they truly encapsulate everything about Women’s Day. A woman is not just a mother, wife, sister or daughter but she is a bountiful entity who can bear enormous pressure and still remain poised and graceful. The women listed above are a testimony of that. Posted in Women and tagged Farahnaz Zahidi, International Women's Day, Pakistan, Women Deliver 2015. Bookmark the permalink. I read in News paper DAWN about a old woman driving taxi.